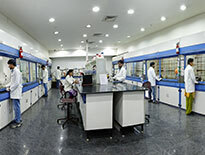 Analytica Chemie Inc is a Contract Research Organization (CRO) with an excellent proven track record of delivering various complex projects on custom syntheses and process development of impurities, reference standards, metabolites, labelled compounds, APIs and advanced intermediates, library molecules, peptides etc. It is conveniently located in Peenya Industrial Area, Bangalore, India. At Analytica Chemie Inc., we have a team of Synthetic Organic Chemists with in-depth knowledge and experience in complex organic syntheses including prostaglandins, alkaloids, steroids, terpenoids, antibiotic products, heterocyclic compounds, carbohydrates and peptides etc. Our scientists are well trained to design and synthesize difficult-to-make, complex organic compounds using cutting edge technologies and methods with multi steps, ranging from milligrams to kilograms. We also provide analytical services that include analytical services, analytical method development, method validation, isolation and characterization of unknown impurities, stability studies for drug products in accordance with ICH guidelines. Our state-of-the-art synthesis laboratory and analytical laboratory are ISO 9001:2015, ISO/IEC 17025:2005 (NABL) certified / accredited. Analytica Chemie Inc has state-of-the-art synthetic laboratories that are ISO 9001:2015 certified. 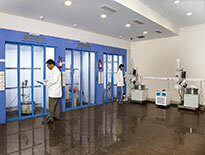 Our synthetic facility includes R&D labs and kilo labs, both measuring about 5000 sqft. 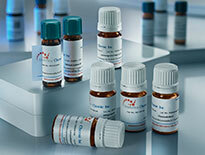 We are a one-stop source for analytical services for pharmaceutical, food Industry. 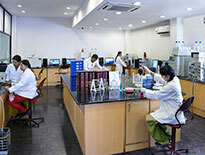 Our state-of-the art analytical chemistry laboratories are well equipped with the following instruments. Analytica Chemie Inc has GMP & GLP compliant, state-of-the art Synthetic laboratory and analytical laboratory are ISO 9001:2015 certified and ISO/IEC 17025:2005 (NABL) accredited. Copyright 2017 Analytica Chemie Inc. Designed by India Business Online. All rights reserved.